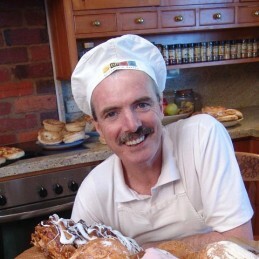 Tom O’Toole is a baker extraordinaire, author & inspirational speaker, and founder of the famous Beechworth Bakery. He may be somewhat small-town, but small-town or not, he is a marketing guru who dares to – and does – walk the talk. O’Toole is to Beechworth Bakery what Colonel Saunders is to KFC. But unlike the Colonel, Tom isn’t content with being a cardboard cut-out. He wants to talk, be seen and be heard. He gives Beechworth Bakery its unique character. Tom O’Toole is a juggernaut in the competitive world of retail marketing. A self-confessed kindergarten dropout from dirt poor origins who didn’t know his ABCs, he is living proof of the power of striving for your dreams. With a formidable sense of humour and an enthusiasm bordering on inspired frantic madness, he has spearheaded the rebirth of a dying country town by turning his bakery into a phenomenon of Australian small business, which continues to gather strength and speed. It is this attitude that ensures the $15 million turnover every year (and counting), making Beechworth Bakery one of the topselling retail bakeries in the Southern Hemisphere. Tom’s passion for spreading the word on motivation and achievement has resulted in a natural ‘metamorphosis’ with speaking engagements throughout Australia and overseas. He happily shares the secrets of his success through a range of products, articles, DVDs, workshops and speaking engagements, and is a rare act to follow. When he talks, all distractions fall by the wayside. The sudden crescendo in his voice is like caffeine to his audience; everyone sits up and takes notice. No exceptions. Tom O’Toole has been awarded an OAM in the 2018 Queens Birthday Honours List for services to the retail baked goods industry and to the community of Beechworth.